Drumnagarrow (Glenbucket). Druim nan gearran, "ridge of the horses." Half way up the north side of the Glen situated well up the hillside is a small cottage of Drumnagarrow. Despite its apparent insignificance the cottage holds a lot of history. This was the home of James Strachan, the famous fiddler, known as Drumnagarry or Drumnagarrow. James daughter Mary also went on to marry William Hardie, whose son was one of Scotland’s most famous violin makers James Hardie. He is the inspiration behind the tune Drumnagarry (or the fishers Rant) composed by the famous Deesde fiddler Scott Skinner. (THE FISHER'S RANT. AKA and see “Drumnagarry.” Scottish, Strathspey. G Major. "The Right Honourable the Earl of Fife, and suite, arrived at Glenbucket the 5th curt, on his way to Duff House. On Monday, his Lordship's numerous tenantry, hearing of their Noble and beloved Master being among them, assembled to the number of several hundreds, with all the bonny lasses of the glen, to make merry for the occasion. The weather being very fine a large barn and extensive tent were fitted up, and brilliantly illuminated for the occasion, replenished with plenty of bread and cheese, and mountain dew. At eight o'clock, a deputation of about a hundred handsome highlanders, accompanied by Drumnagarrow, and his soul-inspiring band, waited on his Lordship, at the Manse, who most condescendingly walked to the ball-room, filled with beauty: - the surrounding mountains blazing with bon-fires - the rugged peak of Benew one sheet of flame." From other sources we know that Strachan's forte was as a fiddle player, and other fiddlers, James Scott Skinner, for example, have paid tribute to his skill and brilliance. “Mr M'Combie is an enthusiast in Scottish music, and an excellent judge of it, and has a fine collection of old strathspeys, many of them in MS., and very rare. He loves to recall the powers of the late Mr James Strachan, the famous Drumnagarrow, who used to be the leading player at the Easter Skene balls many years ago." Finally the family tree is shown at the foot of the article. James Strachen in Drumnagarrie and Jean Thom his spouse had a son baptised called James before witnesses"
Another record exists in the IGI of a baptism on 4 September 1783 of James Strachen whose father was James Strachen. In it the names of the witnesses were noted as 'John and James Forbeses in Tambreak'. In 1851 James Strachan was living in the parish of Aberdeen Greyfriars with his daughter Ann. James was recorded as 64 years of age and Ann as 26 years. Both had been born in Glenbucket Parish, Aberdeenshire. Ann was single and recorded as a house servant. James was a widower and by occupation was a musician. The 1861 census for Strathdon Parish in Aberdeenshire recorded Margaret Coutts living at Ballochhilech with James Warrack, styled the head of the household, and James Strachan, recorded as a lodger. Margaret Coutts was recorded as a domestic servant. James Warrack was a merchant grocer who had been born in Towie parish. He was unmarried and aged 57 years. Margaret Coutts was unmarried and aged 50 years. Her birthplace was Strathdon parish. James Strachan was a widower, aged 78 years, and a musician. His birthplace was Glenbucket parish. In 1871, the census recorded Margaret Coutts as head of a household living at Ballochhilech in Strathdon Parish, Aberdeenshire. She was unmarried and aged 65 years. Her birthplace was Strathdon parish, and her occupation that of merchant grocer. Two others lived in the household: James Strachan, recorded as her uncle, a musician of 87 years and a widower whose birthplace was Glenbucket; and James Warrack, designated a boarder, who was a retired farmer's son, unmarried, aged 66 years, who had been born in Towie Parish. James Strachan, a carpenter and widower of Ann McKenzie, died 2 October 1874 in Strathdon Parish. His recorded age at death was 91 years. His parents were both deceased. In the death certificate of his son, James, in 1894, James Strachan was recorded as a farmer, deceased. In the death certificate of his daughter, Mary Hardie, in 1910, James Strachan was recorded as a farmer. STRACHEN Baptized James son to William Strachen in Drumnagarie"
Said day James Strachen in Drumnagarie & Ann McKenzie his spouse had a daughter baptised called Mary before witnesses"
John Christi in Belnacraig & James Strachen elder in Drumnagarie"
This therefore may have recorded James Strachen as alive in 1805. "James Strachen younger in Drumgarrie & Anna McKensie his spouse ...etc"
thus suggesting that this James Strachen, the elder, his father, may have still been living then in 1806. In the Inventory of the Moveable Estate of the deceased James Strachan compiled in James Strachan was recorded as 'sometime farmer at Parkstile of Tillyfour, Oyne, and latterly residing at Mains of Tillyangus who died on the first day of June one thousand eight hundred and twenty eight years'. because James died intestate, his daughter signed an affidavit concerning his estate. 'Aberdeen 31st July 1828. The above is the Inventory of the moveable estate of the deceased James Strachan, father of me Mrs Christian Strachan or Home referred to in the affidavit emitted by me as his Executive before the Commissary of Aberdeen of this date (signed) Christian Strachan'. the document goes on to confirm that Christian Strachan resided at Mains of Tillyangus, but curiously refers to her as the 'only surviving child of the deceased James Strachan sometime farmer residing at Parkstile of Tillyfour of Oyne and latterly residing at Mains of Tillyangus aforesaid and wife of Peter Home farmer there.' The document authorised Christian Strachan to enter into the possession and management of her father's moveable estate. The value of that estate was between one hundred and two hundred pounds sterling. In the death certificate of his son, James, in 1874, James was recorded as 'James Strachan, farmer (deceased)'. There was also a family of Strachans at Drumnagarrow in Glenbucket, (now, it is believed, extinct,) which was understood to be of the Glenkindie stock. The last of this family was a famous violinist, and had a great reputation as a player of strathspeys." 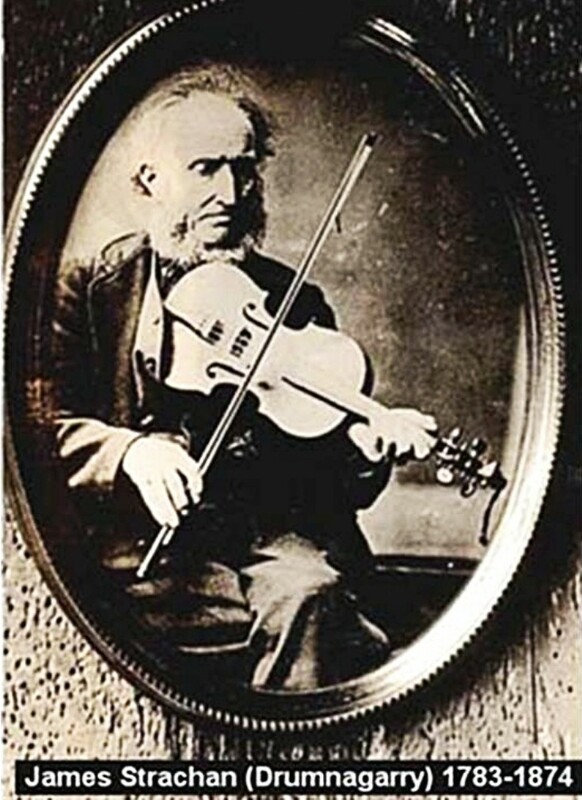 The family was not, in fact, extinct as stated, though there was a famous violinist, John Strachan, baptised 1775 in Glenbucket Parish, son of James Strachan, who composed 'The Fisher's Rant' later renamed 'Drumnagarry'. "Strachan October 8th 1702 James Strachan burger and piriwigmaker and Marjorie Tavendale his spouse had a son named William baptised by Mr William Forbes Minister of the Gospell at Leslie William Sympson merchant and Postmaster, William Burnet Merchant, William Rag son to bailie Rag, and William Cruickshank merchant godfathers"
"March 14 1744 James son to William Strachen in Drumnagarie"
The baptismal register of Glenbucket Parish recorded the baptism on 10 January 1745 of 'Margaret daughter to Margaret Couts Wm. Strachen sponsor'. Margaret Couts married Peter Smith in 1748 in Glenbucket. STRACHEN James Strachen in Drumnagarie had a son baptized named John before witnesses Arthur Thom in Bellamore and ... William Strachen in Drumnagarie"
Another name for James was STRAQUHAN, James. 1700. Mar. 2. George Walker, maltman at Litlemill ; James Fiddes, son to James Fiddes, merchant ; John Smith, younger son to John Smith in Seaton ; George Mckallan, servitor to Jannet Moir; Wm Forbes, onlie son to Wm Forbes, taylor; James Strachan, barbor; Wm Walker, servitor to the sd. George Walker; John Taylor, eldest son to umqle George Taylor in Seton. As the historian Margaret Pelling said about membership of the Barber-Surgeons' Company in London in the 17th century, many in that period were actually distillers, innkeepers, hosiers, colourers, pinmakers, hatpressers, musicians, dyers, perfumers, tallowchandlers and tailors..."
5 May 1701 James Strachan barber and periwigmaker and Marjory Tevindale contracted George Gordon Tayleor caur. for him and Rot. Burnett for her"